The L2 rotary cam switches are available for full control and load applications up to 25 amps. This line provides standard and non-standard configurations, modular and safety features for any application. The L2 control and load switches are UL listed, CSA approved and comply with the most important international standards. These components are designed from brass and copper content to help dissipate heat. The “strip-free” saddle-clamp terminals guarantee reliable connections. “Ring-tongue” connectors can be installed to assure the tightest connection. 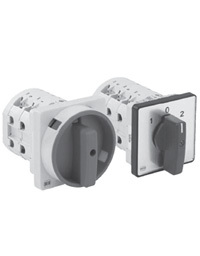 There are several various switch handles to choose form that offer IP66 protection.